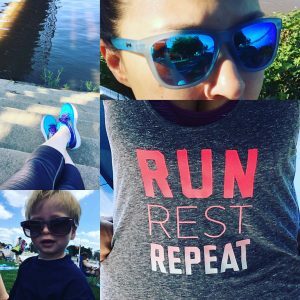 Thirteen weeks might sound like quite a bit of time to train for a half marathon, but with the added challenge of simultaneously trying to raise money for galactosemia research, we figured we could use all of the extra time we can afford. In an effort to raise awareness and dedicated galactosemia research funds for the Children’s Hospital of Philadelphia, I have again signed up for a half marathon and we are asking for the support of our friends and family as part of Team CHOP. We have more than doubled our goal from 2016 and are aiming to raise $2,500 in 2017! This year, I will be running the Hershey Half Marathon on Oct. 15. If you are able to contribute to this cause so near and dear to our hearts, we would be forever grateful. Whether you are looking for a use for the spare change in your couch cushions or you have a larger amount in mind, no donation is too small! Every little bit will help propel us over the goal line and we know we will not be able to get there without all of your love and support. Please visit our donor page HERE or click on the “Make a Donation” on the right side of this page. Check back here for updates on my training progress (spoiler alert: the key to my success is a lot of four-letter words) and for updates on fundraising progress. If you have any questions at all, please let us know! Hello all of you glorious humans! You may have noticed I’ve been on a bit of a hiatus for the past few months. I knew heading into the holidays, we wanted to spend time focusing on enjoying family time, creating new traditions and memories, and catching up with friends, which meant taking as much of a break from the regular push-pull of life (including this site) as possible. Add to that scheduled break both John and I starting new gigs (surprise!) and bing-bam-boom…Happy February! The appointment, which marked one full year of Oliver living with galactosemia, went really well. 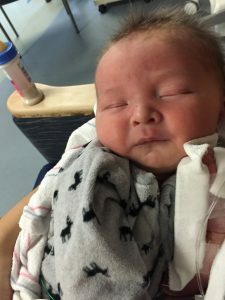 He’s showing proper weight and height gains, his physical development is right on track, and so far there hasn’t been anything to point to other complications. As always, the visit included a trip to the lab for a blood draw (awful as always, but that’s a post for another day) and should have included a urine collection. Unfortunately, we had made the appointment for late in the day and Oliver’s bladder, no matter how much we pumped it full of formula and water, just would not cooperate before the lab needed to close. We also had our regular meeting with one of Oliver’s dietitians while we were there. We are finally (FINALLY!) 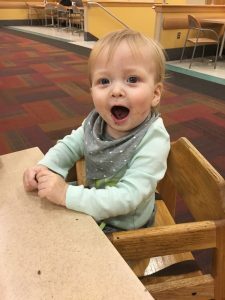 making the move away from his soy formula and towards dairy-free milk like a big boy! We had been making a gradual, and pretty passive, shift toward weaning but now that we have an official green light, it’s both exciting and petrifying. His soy formula has always felt like the tether that was keeping him safe at dock. In my mind, it was also the thing keeping his numbers trending downward. Now, it feels like we are starting to drift out to sea and it is hard to feel at ease with the change. Fast forward a few weeks (well, more like 6 to 8 weeks) and we received Oliver’s Gal-1-P result. To our surprise, it went up. Not a large increase, and not enough for his doctor to be alarmed, but it is still so disappointing. His numbers have been going down beautifully since his diagnosis…until now. To give you a frame of reference, we are told that the Gal-1-P in a person without galactosemia should be less than 1. 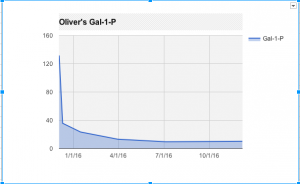 When Oliver was admitted to the N/IICU a year ago, his was higher than 130. As a galactosemia patient, Oliver’s doctor would be happy if his Gal-1-P gets down to less than 5 and remains there throughout his life. His most recent Gal-1-P prior to December was 9.6 (so close! ); it was 10.33 at his December appointment. It went up and we haven’t even gotten it below the ideal baseline yet. It’s hard not to panic when you see the results for your child – once so beautifully trending downward – start on what appears to be an uptick. It’s hard not to feel as though you are failing him somehow. That you must have done something wrong, read the labels of his food incorrectly, given him something that he shouldn’t have. Familiar feelings of panic can start to bubble up and bring you back to that very lonely and sad place you once were earlier in diagnosis. But then, hopefully, you will have a helpful, gracious doctor to bring you back to the present. 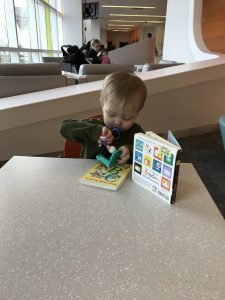 Even though I know his doctor would have called with a follow-up if he had been concerned with Ollie’s numbers, I couldn’t help myself from calling his office. Thankfully he returned my call the same day, heading into the evening, sparing me from a restless night of worry and what-if’s. He reassured me that this isn’t out of the ordinary and reminded me that there is a standard deviation with the Gal-1-P (i.e. an acceptable error rate) of 1 or 2, so that this number alone isn’t a cause for alarm. He also reminded me that a small change like this is less concerning than a huge upswing that might alert us to something wrong and that, given Oliver’s very high number at diagnosis, he’s been very happy with his progress and trends so far. And, perhaps most importantly, he reminded me it’s always okay to ring him when I’m concerned, he’s happy to answer my questions (even if it’s for the millionth time; my words not his), and that Oliver is a healthy, happy kid. We hung up and I proceeded to cry (shocking, I know), mostly from relief but a little bit because when you feel vulnerable and scared and someone is kind to you and reminds you, with some authority on the matter, that your kid is fine, it can be hard not to cry from a combination of happiness and gratitude. Then, in January, Oliver was due for a check-up with the pediatric ophthalmologist. One of the more common conditions that can arise in children with galactosemia is cataracts. This was Oliver’s third eye exam since birth (once in the N/IICU and another at around 2 months old). I am happy to report his eyes are still clear. This also happened to be the first big doctor’s visit that I did not attend with Oliver. As mentioned above, John and I both started new jobs this year and we have needed to do a little more divide-and-conquering to make sure Oliver’s needs are being met. I was a little nervous to hear how Oliver would handle the dilation drops now that he has arms that can certainly take a swing at you and legs that can land a pretty good kick out of protest. John was happy to report that he took the drops and examination like the champ that he is. Even though his eyes are still clear, we’ll continue to monitor him annually or sooner if we have reason to suspect anything with his eyes has started to change. We also managed to get a urine sample to the lab on that trip, so we are awaiting his galactitol result. So, long story short: We’ve made it through a year! And so far, so good. I’ll be back to providing updates semi-regularly now that the dust on the new year has settled! *Of course, these two numbers aren’t the only two that matter and there are a host of other tests, measurements, etc. run each time he goes, but these are the two, at least at this point, that we are the most concerned with keeping in check. It’s the night before the big race and I’ve had the overwhelming feeling all day that the universe is trying to remind me just how good and decent people can be. Take this talisman. It’s hanging on the front door of my lodgings for the evening. 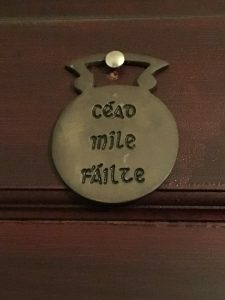 I had never heard the phrase before, but recognized it as probably Gaelic and when I looked it up I see the literal translation is “a hundred thousand welcomes” and it is, in fact, a common Irish greeting. After the day I have been having today, it seems evermore meaningful. When we originally planned this trip to Philadelphia, John and Ollie were supposed to be joining me so we had booked a hotel near the start/finish of the course to make life easy. We booked months in advance and it was still ridiculously expensive. We could have booked something further way, but the added headache of finding parking and navigating closed roads hardly seemed worth it. We even contemplated getting up super early and driving in from Harrisburg the morning of but, again, that seemed like a logistical nightmare. So when we finally decided a few weeks from race day that it would be too much to schlep poor little O to the race to hang out all day just to catch a glimpse of me for a few seconds on the course, we started to reevaluate. It’s one thing to justify the expense of the hotel when all three of us needed a place to stay, but now that it would just be me flying solo, it gave me pause. Don’t get me wrong, the idea of having a large comfy bed all to myself for the night in a luxury hotel sounded fantastic, but it just seemed like a little too much. So I decided to go with an Airbnb rental instead. Renting a room in someone’s home, rather than their full apartment or house, would get me close to the start line without breaking the bank. Double win. I was a little apprehensive about it but I knew in the end I was only really going to need a place to lay my head for the night and the race starts at 7:30am so I would be out the door so early that even if it ended up being the worst experience of my life, it would only be brief. To my surprise, my host, Bill, has been absolutely amazing. Accommodating, easy-going, kind, and helpful. Truly everything you ever wanted in an Airbnb host. And the thing is, I would have showered him with all of this lavish praise even before he did the most amazing thing ever. When I got here, we started chatting about my plan for the morning (he already knew I was running), other times I had been in the city, etc. 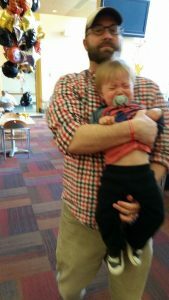 I mentioned that my most recent Philadelphia outings have been to CHOP where Oliver sees his doctors and then we started talking about my #TeamCHOP fundraising efforts and galactosemia in general. I didn’t think much of it more than just making conversation. But before he left for dinner, he came by my room and handed me most of what I paid to stay here and insisted I put it towards our fundraising efforts. He said when his daughter was born, she spent some time at CHOP and it is a place that means a lot to him as well. I tried to tell him it was absolutely not necessary. And then I cried. I cried a lot, you guys. How could I not? How could a completely out-of-the-blue act of generosity and kindness from a person who I had just met not reduce me to tears? It’s a reminder that goodness is out there and shows itself when it can. Sometimes in little ways, and sometimes, like now, in the biggest and best ways. I’m going to carry this feeling with me into tomorrow where, with any lucky, I won’t need the little emergency car to come scrape me off the pavement and scoop me into the cart. Wish us luck!